Roll-top closure for total weather protection. Side pocket with water resistant YKK® zip. Easily removable white liner for washing. Add to other US-Drypacks to create a modular luggage system. Universal fit to any bike including off-road bikes with the bolt-on loop straps included. 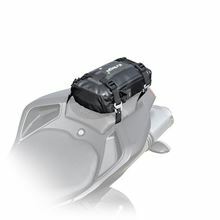 Hook on to any Kriega Backpack or Messenger Bag for extra waterproof storage. 11.8(h) x 6.3(w) x 3.9(d) ins.